The Brian Coyle Community Center is located a few blocks away from Midwest Mountaineering. It serves primarily Somali youth. 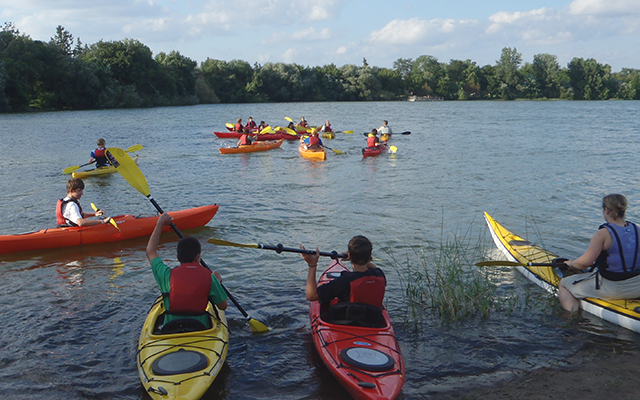 For the past few years we have taken the youth from the Brian Coyle Community Center kayaking on Lake Nokomis, hiking along the Mississippi River and climbing in our Climbing Cave. This year Midwest Mountaineering owner Rod Johnson is leading a group of youth from the Brian Coyle Community Center on an eight day BWCA trip through the Big City Mountaineers. They have had a great time and so have we! Midwest Mountaineering, YMCA Camp Menogyn, Outward Bound and other sponsors have partnered to send kids to camp to experience canoeing, climbing or backpacking. In 2010 we sent 10 kids. During the summer of 2011 we sent 22 kids to camp that could not afford to go. Want to help kids experience the wilderness? Midwest Mountaineering will match tax-deductible donations! Please consider supporting this unique effort to offer wilderness experiences for teens that could otherwise not afford it. In addition to Camp Menogyn and Outward Bound offering camperships for half price, Midwest Mountaineering will match your tax-deductible donation, dollar for dollar. Just write your donation check to either YMCA Camp Menogyn or Outward Bound. Any amount would be helpful. Please send your check to the attention of Rod Johnson, Midwest Mountaineering, 309 Cedar Ave. S, Minneapolis, MN 55454. Contact Rod Johnson for more information: [email protected]. Midwest Mountaineering sponsors a Venturing Crew. Venturing’s purpose is to provide positive experiences to help young people mature and to prepare them to become responsible and caring adults. Venturing is a co-ed youth development program of the Boy Scouts of America for young adults who have completed 8th grade and are under 21 years of age. The Venturing Crew follows Midwest Mountaineering’s lead – non-political, non-religious and non-discriminatory. The Venturing Crew goes backpacking, canoeing, kayaking, climbing, cross-country skiing, snowshoeing and winter camping. The Crew meets weeknights bimonthly at Midwest Mountaineering or nearby areas. Many activities the Crew does are free of charge, some Crew activities have costs associated with them. • Had opportunities to go places and do things I had never experienced. • Learned to get along with people different from myself. • Practiced skills of cooperation and teamwork. • Had an adult to talk with about important issues. • Were encouraged to share my ideas and opinions. • Being a Venturer has taught me to have more self-confidence. • Activities in Venturing helped me prepare for the future. In less than a year the Midwest Mountaineering Venturing Crew has kayaked, climbed, winter camped, snowboarded, and backpacked on the Superior Hiking Trail and kayaked on the Kinnickinnic River and Lake Nokomis. In Venturing the youth initiate and plan activities and trips. However, leaders are needed as well. We welcome parents of participating kids and other interested adults to volunteer their time to lead the Venturing Crew. For more information contact Steve Schreader [email protected] or James Swanson (Crew Advisor) [email protected].